Welcome to the latest post in our Closer series — a look at how technology brings couples, family, and close friends closer. 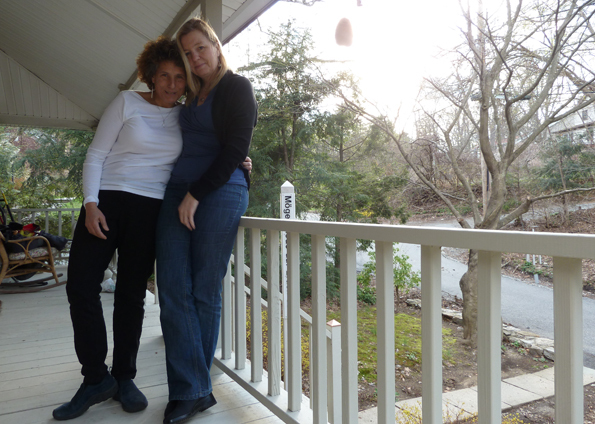 Laura and Helene are partners living in Westchester County, NY. Laura is an energy healer, couples counselor and yoga teacher, and Helene works for NBC in their news broadcast division. They both love BMW motorcycles and met through their motorcycle club, Sirens MC NYC. Unbucket: How does technology bring you closer? Laura: We do a lot of texting, which probably most people do these days. I think what’s nice about it for us is that Helene, you know with all her traveling and being in situations where she can’t pick up the phone or sit at a computer, she can text me in the middle of a busy day or on a shoot when she has a free minute. I feel like I can share more in her experiences through texting. I think that brings us closer. Helene: No seriously, a lot of times we’re doing an interview and I can’t talk to Laura, but I’m just listening on headphones so I can absolutely text her. It’s great, it’s really great. Laura: Helene doesn’t use very much technology. [Laughs] She doesn’t do the social media thing, I mean she’ll send me photos from everywhere, that’s another thing she does, but she’ll do that in a text or in an email. Helene: I’m not on Facebook or anything like that. Laura is, mostly for business, but I haven’t created a Facebook account or LinkedIn profile, or any of that. I just don’t want to get sucked into the computer that way. [Laughs] I feel like I’m pretty much in touch with everyone I want to be. Laura: I’m on Facebook, I’m not doing it every day, just really for some of the business postings and things like that. Helene: For both of us, when it comes to technology, it’s mostly using our iPhones, texting, sending each other pictures and emailing — that kind of thing more than anything else. 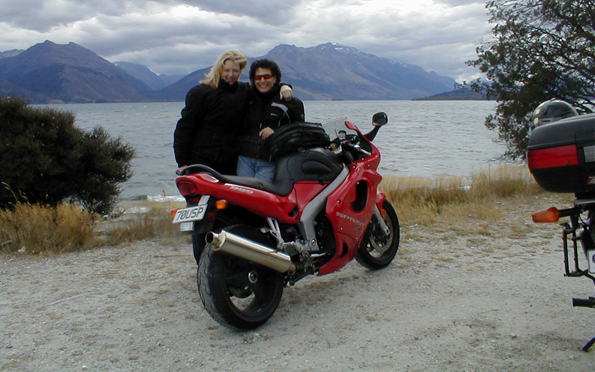 Unbucket: Riding motorcycles is an integral part of your relationship. How has technology enhanced the way this shared passion brings you together? Helene: I like to use GPS. One of the things we do with GPS is download routes from friends. I think motorcyclists are people who use GPS for something other than just putting in an address. We use GPS much more extensively to map out routes and do file exchanges. I’ll load maps on Laura’s bike and we’ll both have the same route. That’s kind of fun, right? Laura: Yeah, it definitely does make it fun. Sometimes we’ll be wherever, like Vermont, and we’ll do all these avoidances after entering our home address, meaning we’ll say, “Don’t go on highways”, “Don’t make U-turns”, “Don’t do this, “Don’t do that.” Sometimes we’ll both put these avoidances into our separate GPS units and they will come up with two different routes! Then it gets really funny because we’ll be riding and Helene will say over our intercoms, “Well mine says turn here!” and I’ll say, “Well mine is saying not to turn here but to go 2.8 miles and turn there!” And so we do this debate over which one we’re going to take [both laugh] and it becomes quite comical. Very entertaining for us. Helene: The other piece of technology we have are “comms” in our helmets, these German-made communication systems for our helmets that we use to talk to each other. That’s a technology that has been unbelievably fantastic, because even though we’re on separate bikes, we can say, “Did you see that?” or, “Oh, did you see that house?” That has made riding together feel really close, because before, it was like we were each in our own little independent worlds, which we still are, but now in a moment’s notice we’re back together again. Don’t you think so? Laura: Oh definitely. To me, what’s the point of going on these trips together if we can’t have any communication until we get off the bikes? It makes such a difference. We can really share the experience a lot more intimately because we can communicate in the moment. Traveling abroad means leaving the Beemers at home. Unbucket: You both experienced Hurricane Sandy first hand. How was your ability to communicate affected? Helene: There were times during Hurricane Sandy when I couldn’t get a call out, but I could text, so that was pretty cool. I was doing stories in horrible places and sometimes I couldn’t even reach Laura to let her know I was okay. Laura: That was important. Texting was really like a lifeline during that experience. If you couldn’t text, if you weren’t able to text, you were out of connection with everyone. We were completely isolated here. Trees were down in every direction. The only way to talk to people was through texting. Even though it was delayed, it still got to people and they could get back to me. Unbucket: As a society, do you think technology is bringing us closer or driving us apart? Laura: I think for or people that are already living a more isolated life, the technology allows them to stay that way. But if a person is already relatively connected socially, it probably enhances their ability to connect because it puts people back in touch with people from high school that they might have lost touch or people from college — really people you would have normally never been in touch with that you can now be in touch with because of social media. Helene: I think there are pieces of me that see a certain amount of superficiality in social media sites. I mean really, friending, people coming out of the woodwork that you have no real association with commenting on things…but I think at the same time, as Laura says, for some people who tend to be isolated or just alienated, it’s a way to be able to communicate despite the fact that you’re not social or you’re just shy — I think that’s really fantastic. Laura: For some people it can be more difficult to maintain an intimate connection face-to-face. They may not be as comfortable going to parties or group gatherings and for them social media technology makes them feel very connected to the people they care about. It’s a very important part of their lives. Helene: Like everything else, in moderation technology is fine. You can’t stop technology, you’re not going to, and who wants to? When you overdo it though and you can’t stop texting and you’re always on your device — you can lose that face-to-face kind of thing in an unfortunate way. It’s just like everything else; in excess, is it good? No. Is it something that’s wonderful? Yes, technology really is. Check out the other Closer interviews we’ve done!